This is my great grandfather, Arthur Bryan Sears (1900-1964), probably around age one. As far as I can tell he was fatherless for his first several years. He had a biological father, of course, and all indications are that it was Oliver "Ollie" Edgar Myers, born sometime around 1873 (and possibly died in 1935). Arthur was born with the Myers name but at some point appeared to be legally adopted by his stepfather, John Alfred Sears (1860-1951). The story of Arthur's father is THE most mysterious one in my family tree. And while their are some surviving family (e.g., Arthur's son, my great uncle, who is 86 years old) who might know the story, they all seem to be a bit fuzzy on the details. It suggests to me that the story was never fully told. And may never be. What I have always heard was, simply, that Arthur was adopted and that his biological father was probably not that nice of a man. That leaves a lot of years and a lot of blanks to fill in. I've tried to piece together details of Arthur's early life. Here is what I think I know. Arthur was born on October 6, 1900 in or near Dugger, Indiana. Though I have no direct documentation about his father, I do have a marriage license between his mother, Clara Rachel Miles (1875-1934) and an Oliver Edgar Myers. The two were married on May 19, 1896. There is plenty of DNA evidence that I won't go into right now to suggest that Oliver Myers was Arthur's biological father. I've connected with several DNA matches through Ancestry who have him in their family trees, though with little info attached. There is an interesting 1900 U.S. Federal Census connected on another Ancestry member's family tree that lists a "Clara Myers", about 25 years old, as a "Servant" in a "Clarke" family. This census was completed in June of 1900, only a few months before Arthur was born. I've not independently confirmed that this is the same Clara, but if it is it suggests that Clara and Oliver separated before Arthur was born. I've not yet been able to find where Oliver was in 1900. I know that Clara married her second husband, John Alfred Sears, on February 15, 1905. John would become Arthur's adoptive father. By the time of the 1910 U.S. Federal Census Arthur was the only Myers (or Miers) living with his biological mother, Clara, his adoptive father, John, and several other half (from his mother) and step (from his step-father) siblings. There is a 1920 U.S. Census that lists an Arthur Sears, about 19 years old, born in Indiana and living in Flint, MI. He is listed as a "lodger" and while I can't be certain this is him, I think the likelihood is high. Here is a photo of Arthur that appears to be from around that time. The back says "Dad, 1919 at Lake View Park in Flint, MI"
What is known for sure is that by the time he married my great grandmother, Ida Rhoads Sears (1900-2002) on April 6, 1921 Arthur had legally changed his name to Arthur B. Sears. 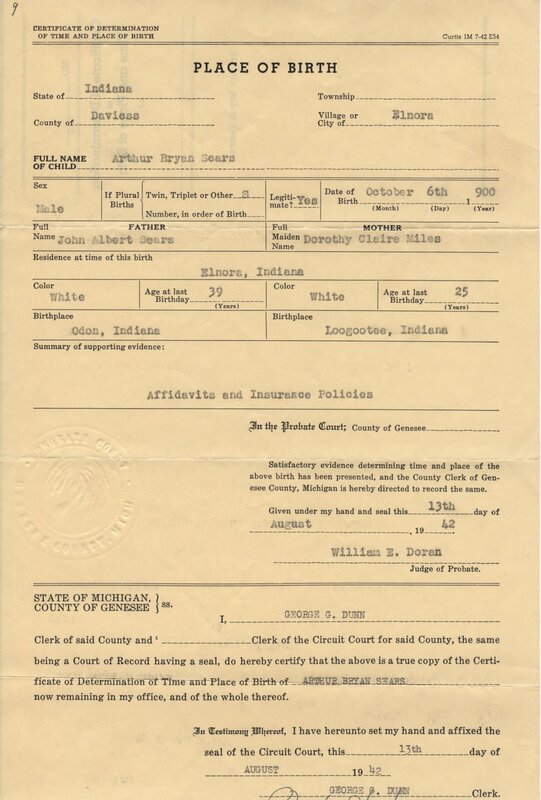 Here is a copy of a Marriage License Record that was completed after Arthur's death, presumably because of issues connected to the settling of his estate. The "Elnora, PA" listed on the form is incorrect. My guess is that this was a clerical error. There is an Elnora, Indiana, near the Dugger, IN. You can also see that the photo of Arthur as an infant was by a photographer in Elnora, IN. I haven't seen any wedding photos of Arthur and Ida, and I am not even sure they if they exist. But, here is a lovely photo of the two of them, probably from the mid 1930s. Here is a later photo of them from 1963, about 6 months before Arthur died. In my great grandmother's papers there was also this "Place of Birth" document for Arthur. It is not clear to me what it was for, or why it was completed in 1942. And here is a professional portrait of Arthur taken in 1955. There are dozens more photos I could include here, but I will save them for another day and another story. I never met Arthur. He died more than I decade before I was born, but his wife Ida lived to be 102! And though I never really remember Ida talking about Arthur I had a sense that he was always in the room. Arthur and Ida had 4 children, one of whom, Dorothy, sadly died from Scarlet Fever when she was only 5. They also had my grandmother, my great aunt, and my great uncle. Before I started seriously researching my family tree a couple years ago I never really had a clear picture of what my great grandfather even looked like. I was lucky to have discovered these old, early 1960s, home movies that someone had transferred to VHS probably 30 years ago. Those in my family will recognize most every one in this film. It includes two of Arthur's daughters, his son (the Catholic Priest), a couple of son-in-laws, and many grandchildren. I am not sure if all of the grandchildren are there, but Arthur and Ida would eventually have 12 in all. I wonder if Arthur ever reflected on his early family life and how different it seemed from the life depicted in this film. For a boy without a dad, Arthur seems to have lived a full life as a father. Perhaps his father's absence had something to do with shaping his family values. Of course there is always more to the story. Things are left out, painful details are glossed over, and sometimes even complete fabrications are created. For now though, I am just glad that I've been able to learn, and share, more about my great grandfather. What ever happened to Arthur's dad? Did Arthur ever talk with his biological father after his parents split up? What was Arthur's relationship like with his step father? How come no one in my family knows the "real" story? How did Arthur feel about the family life he created with his children? This is the 20th of 52 weekly posts planned for 2018. It was inspired by the #52Ancestors writing challenge issued by professional genealogist, Amy Crow Johnson. The challenge: once a week, for all 52 weeks of the year, write about a relative in your family tree.